Before you start the task of washing your car it’s important to have the right wash accessories. To do a proper, thorough job you’ll need a sponge, several microfibre cloths, polish applicator pad, soft wheel brush and a bucket. Once you’re set up make sure you rinse your car using a hose or pouring device to remove any surface debris. Always make wheel cleaning your first task. Apply Wonder Wheels Universal Wheel Cleaner liberally to one wheel at a time. Agitate each wheel with a brush to generate a foam. Universal Wheel Cleaner will cut through dirt, grease and brake dust instantly. 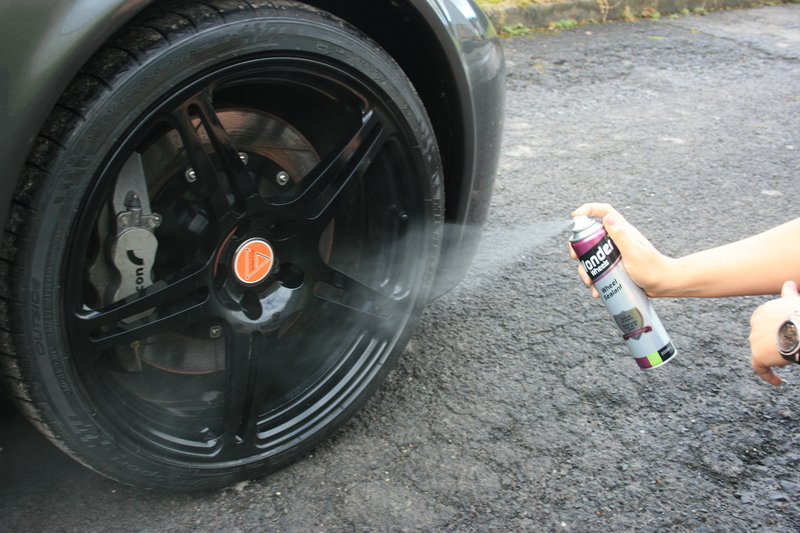 TOP TIP Rotate your wheels 180° before re-applying to ensure any hidden dirt is cleaned off. Rinse off with clean water. Next, use Wonder Wheels Super Wash & Wax. Add the correct amount (as stated on the instructions) to a bucket of warm water and use a sponge to wash the car. Start on one side of the vehicle, from the roof down to the sills and then move round to the other side. Super Wash & Wax effortlessly removes traffic film and dirt, and is fine to use on polished paintwork. Once your car has been washed dry your car off with a chamois or microfibre cloth. Use Wonder Wheels Paintwork Color Restorer to remove light scratches, oxidation and baked on insects. 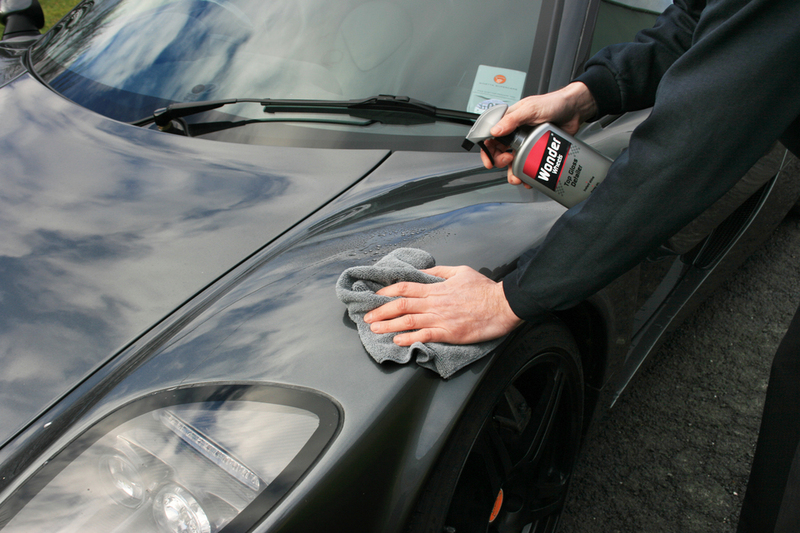 The intense, powerful formula restores the original colour and lustre to vehicle paintwork. Apply a small amount to a damp lint free cloth and work on a small area at a time. Allow to dry to a haze and buff off with a dry lint free cloth. The paintwork is now fully prepared for polishing. TOP TIP May also be used to remove light scratches found around door handles etc. Polishing is an optional step; it can take a little longer than most car washing steps but is definitely worth the extra effort. For people with limited time use Wonder Wheels Top Gloss Detailer which is an excellent alternative or it can be used in-between washing to remove any spot stains or dirt. Simply spray on and wipe off for a high gloss shine. For those car lovers who are prepared to wax their car to enhance shine and protection use our Wonder Wheels Perfection Resin Polish. Apply the polish to a clean dry lint free cloth and apply the polish to the vehicle using a light circular motion. Work on small areas at a time. Allow the polish to dry to a haze and buff the polish with another clean dry lint free cloth. 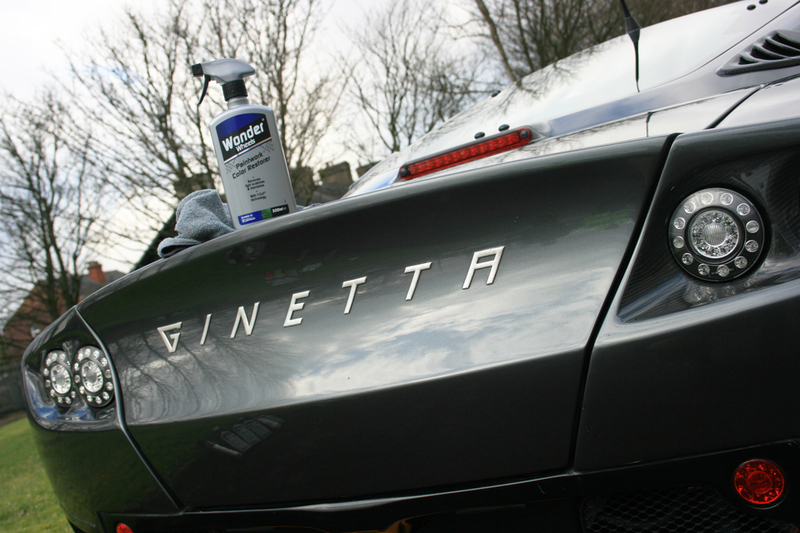 TOP TIP Our Perfection Resin Polish may also be used to improve the appearance of chrome trims and exhaust tail pipes. Now that you have polished your car, lock in that shine, lock out the elements and protect the paintwork with Wonder Wheels Paintwork Sealant for up to 12 months. 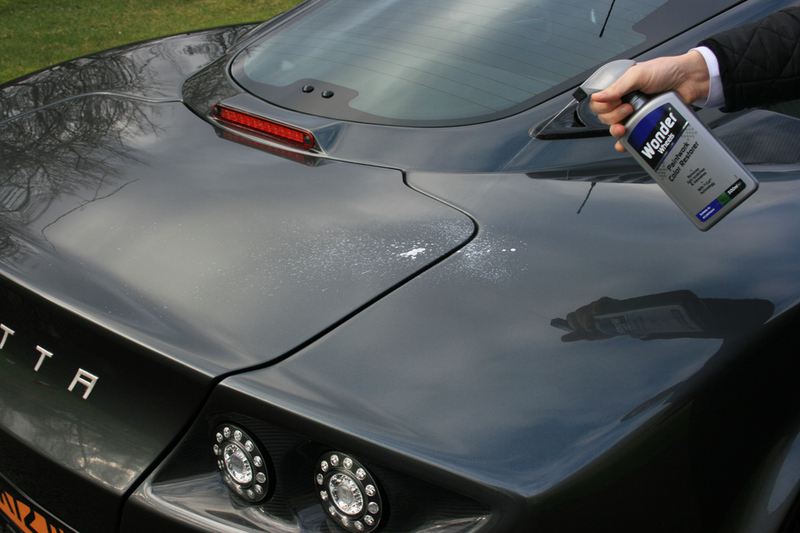 The revolutionary clear paintwork sealant repels sunlight, rain and birdlime whilst sealing the surface to prevent the paintwork from fading or oxidising, which can rust. 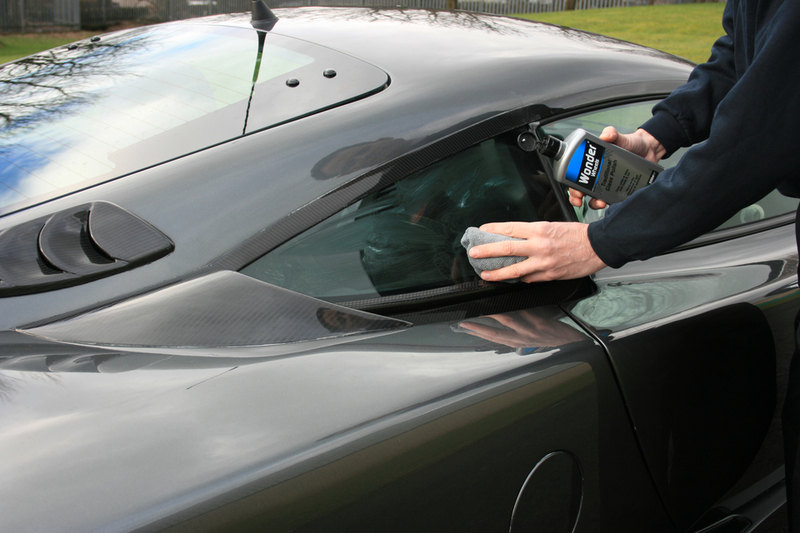 Simply wipe on Paintwork Sealant sparingly with a clean, dry, lint free cloth, one panel at a time. Allow to dry and gently buff if necessary. To prevent overspill, pour steadily and carefully onto the cloth as the solution has a low viscosity due to its revolutionary formula. TOP TIP May also be used on clean or new wheels to prevent the build up of brake dust. Always finish and dress the tyres last. Wonder Wheels Mega Black Tyre Shine contains a unique lubricant to combat the effects of crazing tyre walls. 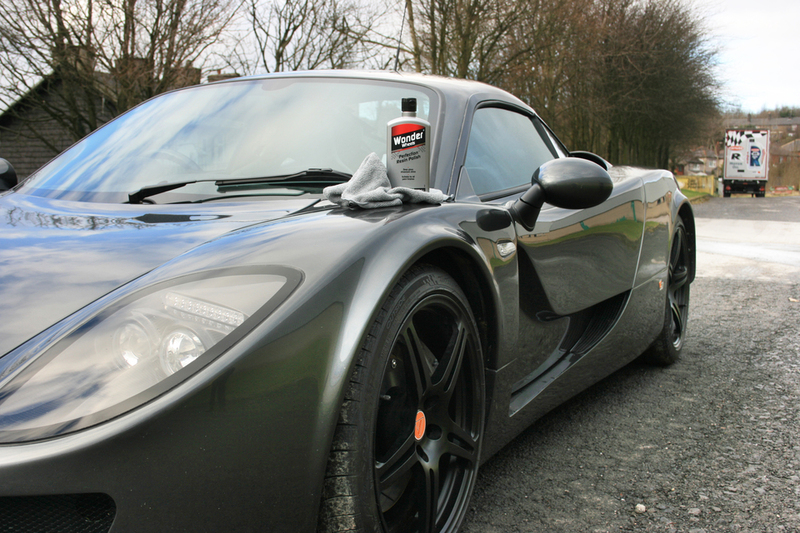 Use regularly to nourish and revitalise tyres and trim and provide optimum shine and maximum protection. Before applying Mega Black Tyre Shine make sure your wheels are completely dry. Spray evenly on the tyre walls, making sure you pull evenly on the trigger to ensure even application. If necessary apply with a cloth. Leave to dry and remove any excess with a clean, dry cloth. TOP TIP Apply to dry tyre walls and leave to dry naturally for a glossy finish. If you prefer an original look wipe off any excess to leave that satin look. That’s the exterior completed, however your interior is just as important. Firstly remove any car mats or loose objects. Dust dashboard, vents and door trims etc. before vacuuming fabrics and carpets to remove any loose dirt. To clean your seats and upholstery use Wonder Wheels Upholstery Shampoo to lift and remove dirt and grime….fast. Our technologically advanced formula contains active detergents, cleaning agents and U.V. brighteners that will clean seats, carpets, roof linings and all areas of upholstery interior trim. Simply spray Upholstery Shampoo generously over the surface to be treated, whilst wet work the product in to the fabric with a sponge or soft brush. Wipe over the cleaned area with a clean, wet sponge or cloth. If the area is heavily soiled repeat the process. Allow for good ventilation to assist in drying. TOP TIP Also leaves a long lasting fresh fragrance that helps mask stale odours leaving your car smelling fresh. Time to add some sparkle to your glass. Use our Wonder Wheels Traditional Glass Polish to clean, polish and improve light scratches from windows and mirrors. Spray a small amount on to a dry lint free cloth and wipe over the glass area. Buff off with a dry lint free cloth for a sparkling shine. Use our Wonder Wheels 2-in-1 Clean Glass for glass that doesn’t require as much attention. Spray sparingly over glass and wipe over with a lint free gloss. 2-in-1 Clean Glass effortlessly removes dirt, bird lime, tree sap, grease, tobacco haze and finger marks in an instant, leaving streak-free glass both inside and out. 2-in-1 Clean Glass is suitable for all types of glass, plastic, acrylics, Perspex; it also contains anti-mist protection for clearer vision and enhanced driving. TOP TIP Use outdoors on a sunny day to highlight any streaks. Use in very small quantities – over application may cause streaks. To clean and nourish your leather interior use Wonder Wheels Leather Clean & Feed. If leather seats and trim dry out the material can crack and fade. Regular cleaning and nourishing helps prevent this, keeping the leather enriched with essential oils and conditioned. Spray a small amount over the surface to be treated or spray onto a microfibre cloth and then apply to the leather taking care not to soak the treated area. Gently wipe the product into the leather using a circular motion, removing all dirt. Leave to dry, if heavily soiled repeat the process. TOP TIP Use regularly to remove light stains. This will also help to keep the leather moisture and supple. That’s it….your car should now be immaculate inside and out.